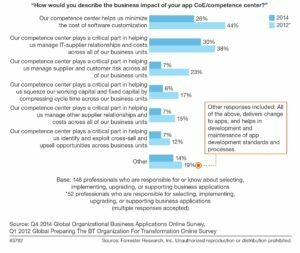 Every company faces a central dilemma: how to resolve the standardization and differentiation of its business apps to win, serve, and retain customers. That’s why we are still getting a lot of questions about this report. We have been wondering how much the move to cloud, mobile, and embedded machine learning or artificial intelligence will change the composition, governance, and effectiveness of the enterprise competence centers we see in our very largest clients. We’re currently fielding a survey for vendors, end users, and experts that will provide the key input for a report on how companies deploy business application centers of excellence (CoEs) to drive an appropriate level of standardization across business units and to establish repeatable best practices. Our last survey showed that CoEs were not making a critical impact in many enterprises. We believe that the situation has changed, but we need your experience and expertise to understand today’s situation. If your company has a center of excellence and you wish to give us your input on its performance, you can find the survey link here. Forrester thanks you for your participation!